Morning sickness (all day sickness actually) awareness month went away during my first trimester. I had a baby in mid June and recovered from surgery in July. I went back to 'work' as soon as I could and celebrated being able to return to running and weight lifting as time went by. My dream of running a marathon will come to pass. I just need to be patient and continue to build my running basis. Believe it or not I haven't ran a race in Texas yet. I would love to do that this year. I need to sit down plan and start training. 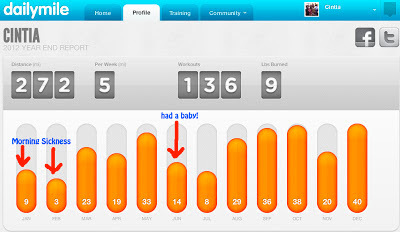 My fitness forecast for 2013 includes persistance, diligence and taking small steps towards my goal of gaining health. My purpose is to be a healthier, stronger mother. 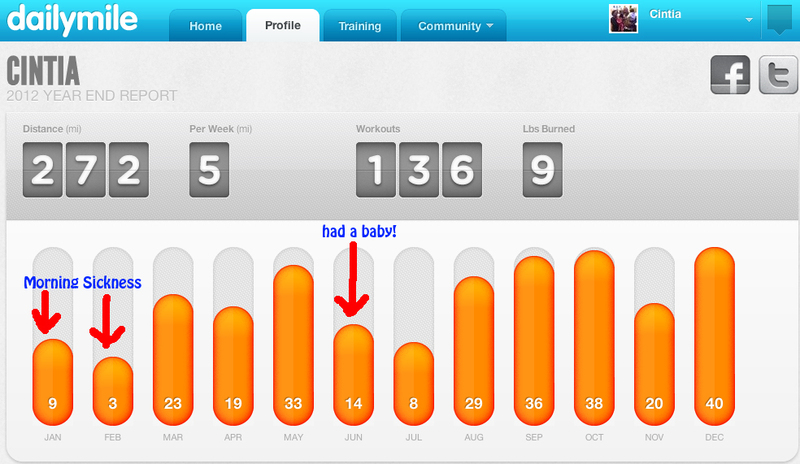 If I continue to make health a priority, this year will be pretty awesome. Now that I have this great picture in front on me, I guess it would be good to try to beat these miles as far as a goal is concerned. QUESTION • What's on your fitness forecast? Parabéns Cintia pelo o que conseguiu em 2012 e se continuar neste ritmo e com esta motivação, tenho certeza de que você vai superar as suas expectativas para 2013! A minha meta é melhorar a minha saúde, ter uma dieta mais saudável e correr com meu marido um 5k!